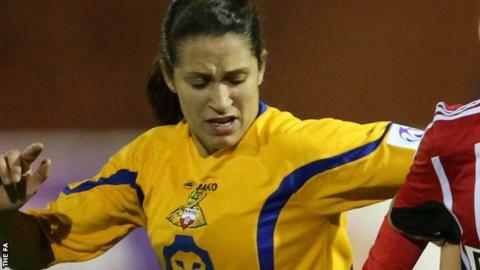 Doncaster Rovers Belles striker Courtney Sweetman-Kirk is set for a lengthy spell on the sidelines after suffering a broken leg in a friendly. The 25-year-old was the top scorer in Women's Super League Two in 2015 with 20 league goals in 18 games, as the Belles won promotion to the top flight. The former England Under-23 player also won the Player's Player of the Year award for WSL 2 last season. Doncaster have played one WSL 1 match so far in 2016, losing 4-1 to Chelsea. Is 'big three' WSL success inevitable? Read more on Women's Super League: Will 'big three' brands inevitably dominate?